Release Fly Travel specializes in the finest fly fishing (and sometimes light tackle) adventures in Costa Rica and around the world with an emphasis on positive local impact, diverse cultural exposure, and overall superb angler experience. By integrating top quality fly fishing, the right balance of roughing it and comfort, a bit of local flavor, and an air of authentic adventure, we ensure you experience an unforgettable trip. Being based in Costa Rica gives us a clear advantage in the region. We have our fingers on the pulse and our toes in the sand, spending time on the water with clients and on our own, refining our local knowledge, exploring new and hard to reach waters and species, and developing exciting programs to offer the fly fishing world. We see a great deal of potential in our small but extremely biodiverse country, and we are in the business of pushing ourselves and the sport of fly fishing to bring our clients the very best the destination has to offer. Whether you seek heart pounding triple digit tarpon, powerful roosterfish and billfish, delicate dry fly or tenkara fishing for rainbow trout, connecting with an array of warm water exotics, or combining many species into a custom-built angling quest around this pristine country, Release Fly Travel is your number one resource for planning and executing the tropical fishing adventure of a lifetime. We also offer hosted & exploratory trips to some of the finest and most remote fisheries around the world, offering the same emphasis on high quality angler experience from start to finish. With a background in fly rodding New England striped bass in the surf, a drive for adventure has propelled Tom throughout the Americas, Europe, and Oceania with fly rods and cameras in tote. 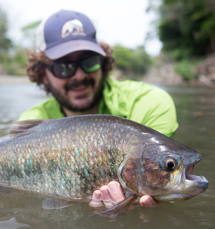 More recently, Tom has dedicated years to chasing fish across Costa Rica’s tropical freshwater and saltwater landscapes, and his local expertise will help you make the most of your fly fishing adventure. Besides fly fishing, Tom is also an experienced birding and nature history guide, and he will take great pride in showing you a side of this striking country that sometimes goes unnoticed by traveling anglers. Tom is also a professional photographer and writer specializing in adventure, nature and conservation subjects. Kevin grew up fishing for trout in the streams and rivers of Pennsylvania, as well as targeting striped bass and bluefish from the beaches of New Jersey. 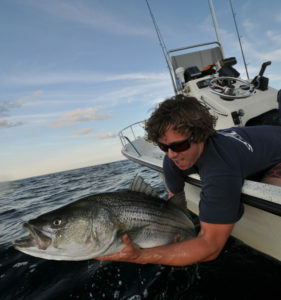 This passion for all things aquatic led him to Rhode Island, where he received a degree in Marine Biology and connected with Tom. After working in New England for ten years promoting sustainable fishing practices with the National Marine Fisheries Service Cooperative Research Branch, he decided that it was time for new experiences down south. He now lives in the mountains of Costa Rica, targeting both fresh and saltwater species with fly, tenkara, and conventional tackle. We at Release Fly Travel take pride in making sure your experience is a great one, whether it’s a one-day trip or an expedition into the wildest places. We are a small well-trained team of travel professionals, and due to this we often work with 3rd party guides around the country and around the world. To guarantee our customers are in the best of hands, we ensure each of these guides understands and can comply with the same level of client care that is given in-house. Moreover, we’ve extensively fished, tinkered with, trained in, and re-thought every destination in which we work to ensure we can anticipate problems as well as promote positive experiences. In other words, rest assured that when you book an experience with Release Fly Travel it will be one you cherish for a lifetime. Read what some of our former clients say about their trips with us. It’s no secret that some of the finest fishing destinations on earth are also the most pristine or remote. That said, we are also aware that the planet’s remaining intact wild places are becoming a finite resource needing strong long-term protection. For this reason, we operate a small non-profit called Conservación Bosque del Sábalo as a conservation initiative supporting our Jungle Tarpon Reserve program in Costa Rica. The goal of this project is to create an internationally recognized tarpon sanctuary together with the surrounding rural communities in order to conserve a globally unique freshwater tarpon habitat in the Caribbean watersheds of Costa Rica by implementing environmental stewardship, community awareness and education, enhanced scientific understanding, and the creation of sustainable economic opportunities. The project uses the vast wetland system of the Jungle Tarpon Reserve as a project nucleus and will eventually scale up efforts to other parts of this unique tarpon habitat/migration route. We’ve also teamed up with KeepEmWet Fishing to promote best fish handling practices. 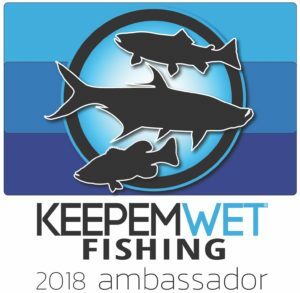 We strongly believe that being a well-informed angler means knowing how to treat your most prized catch as it comes to hand and during release, and we hope to pass some of this science-based knowledge KWF has developed directly to our clients. We’ve helped translate all KWF educational materials into Spanish, and hope to use this to influence the local Latin American audience into taking a major step towards becoming a catch-and-release fishing culture. We as anglers carry a huge responsibility to treat our passion, the fish, with the utmost of care both for our own future days on the water as well as those of the next generation. With any luck, this strong commitment to conservation will not only protect and improve these globally significant habitats for the future, but it will also ensure our clients experience the very best the destination has to offer, whether that’s this season or many seasons down the road.